HELP US BUILD HOMES, COMMUNITIES AND HOPE! Donate online through our international site at the following link – https://www.habitat.org/donate/?link=802. 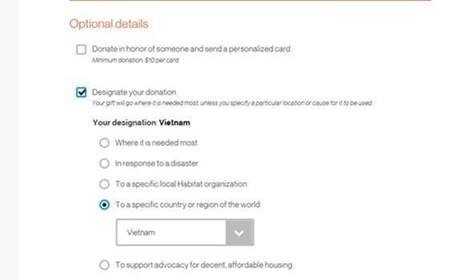 This link allows you to designate your donation to a particular country program. Under the credit card details there is an option to designate. Please see the illustration below.